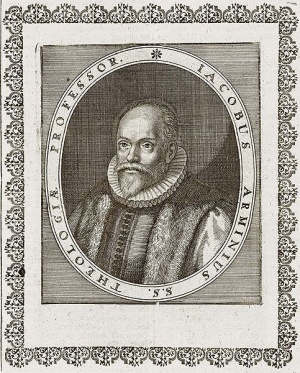 Jacobus Arminius as professor, from Kupferstich aus Theatrum Europaeum by Matthaeus Merian in 1662. Source: Wikipedia Commons. Jacobus Arminius (Jakob Hermans), a Dutch theologian, was born 10 October 1560 at Oudewater, South Holland, and died 19 October 1609 at Leiden. He was educated in his youth by a Catholic priest Aemilius, who had strong leanings toward Calvinism. In 1575 Arminius went to Marburg, and in 1576 to the newly established University at Leiden to study theology. By 1582 he studied at Geneva with Beza, and stayed for a while in Basel. In 1589 he was made Reformed preacher in Amsterdam, where he worked with great zeal and was soon a man of influence. In 1603 he accepted a theological professorship at Leiden, where the excellence of his instruction made him equally influential. He soon became involved in a quarrel with his colleague Franz Gomarus, a rigid Calvinist. The question at issue was the recognition that should be given to the church teaching on the "recepta doctrina." Practically, Arrninius almost rejected Calvin's doctrine of predestination in its full consequence. By his opponents he was accused of being Catholic. In the midst of this quarrel Arminius, the forerunner of the later Remonstrants, died. It is strange that Arminius, who was accused of unorthodoxy by the strict Calvinists, was asked to attack the Mennonites. The Reformed Synod of North Holland had decided in 1599 that "the arguments of the Anabaptists should be collected in a book and refuted on the basis of Scripture for the instruction of the weak." The synod in South Holland of that year expressed the same wish. Arminius took the task upon himself. Reports on the progress of the book were made at the synod year by year. In 1601 he said he was very busy gathering the "voornaemste stucken" (principal articles). In 1602 he reported that the multiplicity of articles had slowed down the work. In the ensuing years Arminius continued to report that he was busy. In 1605 he asked to be relieved of the task, partly on the ground that he was suspected by some (Gomarists) of unsoundness on several points, and wished to be cleared. The work made no progress, and in 1608 the synod decided once more to urge Arminius to undertake it. He died in the following year. Soon his followers accepted the Mennonite confession of Hans de Ries. Zijpp, Nanne van der. "Arminius, Jacobus (1560-1609)." Global Anabaptist Mennonite Encyclopedia Online. 1953. Web. 24 Apr 2019. http://gameo.org/index.php?title=Arminius,_Jacobus_(1560-1609)&oldid=119151. Zijpp, Nanne van der. (1953). Arminius, Jacobus (1560-1609). Global Anabaptist Mennonite Encyclopedia Online. Retrieved 24 April 2019, from http://gameo.org/index.php?title=Arminius,_Jacobus_(1560-1609)&oldid=119151. Adapted by permission of Herald Press, Harrisonburg, Virginia, from Mennonite Encyclopedia, Vol. 1, p. 161. All rights reserved. This page was last modified on 12 April 2014, at 05:46.